With all of the changes to campus this summer, GCU Today is your source for the top ten things all campus students and staff should know this fall. GCU Arena is back in business, and it showed well Saturday when a free concert featuring Switchfoot provided a spirited finale to Move-In. 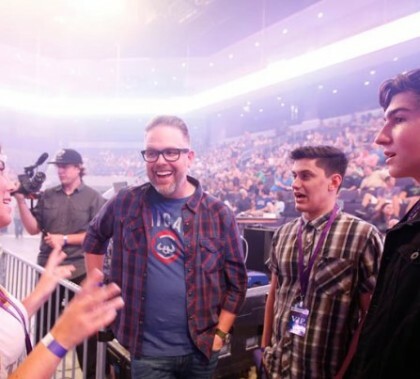 Photos by Darryl Webb/GCU One of the most inspirational moments of Welcome Week was Ignite, a solemn commissioning of Grand Canyon University’s largest-ever freshman class, held on Friday night after a very full three days of moving onto campus nearly 6,200 students. Photos by Darryl Webb/GCU GCU’s newly expanded Arena showed how the University has grown during a free concert featuring Switchfoot for students and staff on Saturday. Smoking and any other kind of tobacco use, including chewing tobacco and e-cigs, will be banned on GCU property and in University-owned vehicles beginning Jan. 1. The new fitness schedule for the Recreation Center, which features several new classes, begins Monday and goes through Sept. 26. The reason: The Rec Center is scheduled to become the Lopes Performance Center, and some classes will move to other fitness centers on campus. The Mash Up: Welcome to GCU! This week’s edition of Antelope Intros features a couple of world travelers who went on their adventures for very different reasons — and one of them has some wild stories to tell. Photos by Darryl Webb GCU News Bureau Day 2 of GCU’s Move-In provided more fun on Thursday: quick-as-can-be vehicle unpacking, assistance from the men’s basketball team and their head coach Dan Majerle, Lopes Up galore and lots of purple.